Next week marks the first time that Egyptians will vote in a constitutional referendum since Mohammed Morsi was ousted from his presidency — and his most likely replacement seems to be none other than the man behind the ouster. On Saturday, army chief General Abdel Fattah al-Sisi told colleagues that he would see a strong yes vote as a mandate to run for office, giving his strongest indication yet that he is hoping to become president. "Egypt is on the threshold of a decisive stage in its history, the results of which are awaited by the world," Sisi said on Saturday. "If I run for the presidency, it must be by the request of the people and with a mandate from my army. When Egyptians say something, we obey and I will never turn my back on Egypt." The state is calling on Egyptians to vote early next week on a referendum on a new constitution, the approval of which seems already to be in the bag. With the now terrorist-designated Muslim Brotherhood calling for a boycott rather than a no-vote, and other opposition parties — such as the Strong Egypt party — also being struck down as they try to urge a no-vote, the interim government has made sure that the rest of Egyptians, who backed Morsi's overthrow, are more than likely to vote yes. But the revised constitution isn't in fact so different from the previous Islamist-drafted charter. The biggest changes? An upping of the power held by the police, the judiciary, and — surprise, surprise — the military. One of the scarier parts of the charter allows the army to bring civilians before military tribunals. 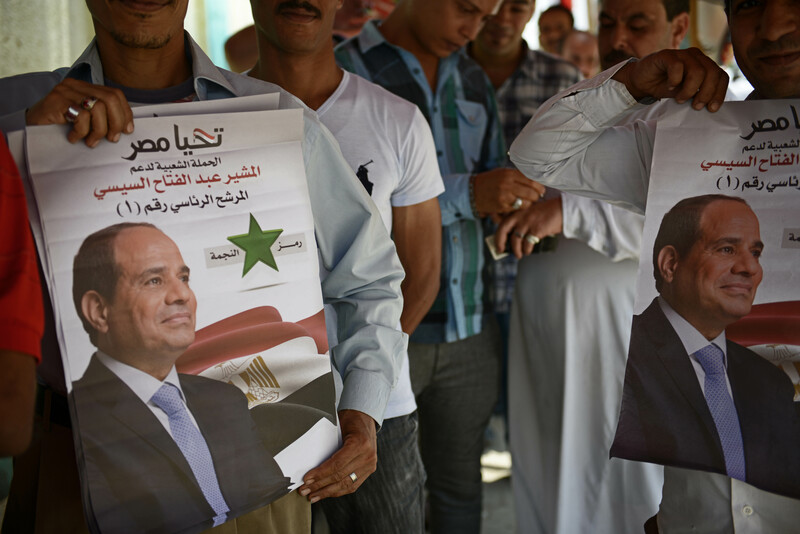 Although refusing to confirm or deny talk of running for presidency since the ouster, Sisi has been seen as a likely contender from the get-go. Not only was he behind the military takeover in July, he has kept a close handle on the running of the interim government since then, and has often been hailed as the revolutionary's savior. "In this way El Sisi running for president might be the best thing that has happened to the revolutionary movement. Social and economic failures will be blamed on those actually responsible, rather than on the sidekicks of the military. This could lead to further de-mystification of power relations within the Egyptian polity, exposing the military regime to direct attack and hastening the collapse of “false consciousness” that has spread throughout the urban middle classes." In a recently leaked audio recording, Sisi told a journalist that he'd once had a dream in which the late president Anwar al-Sadat said to him that he would be president. His response? “I know that I will be president, too.” Talk about creepy.